Mpix founded in 2003, is the consumer arm of Miller’s Professional Imaging, a company catering to professional photographers founded in 1968. According to their website, Miller’s is the largest professional photography lab in the U.S. and with facilities in Kansas and Missouri. Mpix features two main types of photo books, their Assembled Albums and Press books. The Assembled Albums are printed on actual photo paper in your choice of E-Surface, Metallic or Black & White paper and mounted into a leather album. The albums lay flat and the mounted prints have a 1/16” border around them. A 24-page 8x10 album runs $165.00. 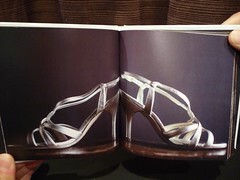 In contrast, the Press Product photo books include soft cover, custom hard cover and suede hard cover books. 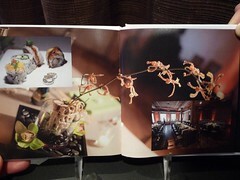 A 20-page 8.5x11 custom hard cover book goes for $50.00. Mpix books have relatively small maximum page counts. The Assembled Albums max out at 40 pages and the Press books max out at 50 pages, so you do need to keep that in mind if you think your project may be longer. MpixPRESS software is downloaded onto your computer and gets high marks for ease of use. It is intuitive and is well designed. You can create custom templates and you can buy templates from Mpix Template Designers. You can use your photo as a background to other photos and you can easily create a two-page spread (a single photo which covers two pages). Limited photo editing is also available within the program. You can rotate, zoom, fade, convert to sepia or black & white and use Mpix’s “perfectly clear” image enhancement that allows you to sharpen, adjust skin tone and color vibrancy. You can also use any font that resides on your computer so your not limited to the 10 fonts offered normally offered by other companies. So far I’ve made one 50-page 5x5 hard cover book with Mpix. As for print quality, Mpix is very good and photos appear sharp. I also liked Mpix’s glossy full photo cover. You can check out my Mpix comparison to Blurb or my comparison review of Mpix, MyPublisher, Blurb and Snapfish. Click HERE to go to Mpix's site! Don't forget to check the main Photobook Deals page for all of today's deals! Bookmark that page or fan me on Facebook and you won't miss out on the latest coupon codes! Save money with the latest Mpix coupons and deals, or see if there are any Mpix groupons. Thinking about designing a photobook on Mpix? You can view a detailed chart of every Mpix photo book, including sizes and pricing. See the full list of Mpix photo books.